As part of the Windows Phone 7 launch, Microsoft planned to send 65 high-profile bloggers a phone to give away to one of their readers. Knowing that this caliber of blogger receives endless products to promote, Microsoft approached us to create something that would help them stand out. While we knew we could deliver a piece that would get noticed, we wanted to do more than that. It had to exemplify what was so different about Windows Phone 7 and, at the same time, show each blogger that we truly understood them and their blog. 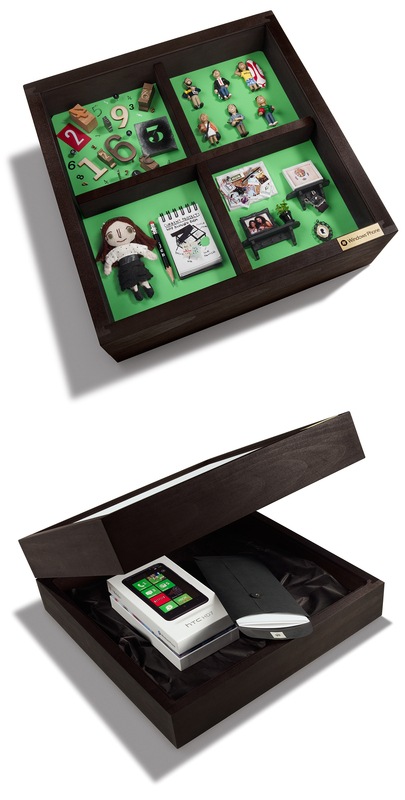 To accomplish all of this, we started by handcrafting wooden shadowboxes designed to bring the unique “Live Tile” interface of the Windows Phone 7 to life. Each shadowbox has four square tiles representing different features of the phone. These tiles were customized based on the theme of each blog, the bloggers themselves, and how we thought their personal Windows Phone 7 interface might look. In order to pull off this level of customization, we worked with an endless number of artists and craftspeople from around the globe to create objects for the tiles, and we scoured flea markets and local boutiques to hunt down one-of- a-kind treasures to include. Once we had all of the items gathered, we hand-assembled the tiles, giving eachshadowbox its own individual look and feel. When a shadowbox was complete, it was loaded with a phone, wrapped in black craft paper, labeled with the name of the blog, and shipped off in an insane amount of bubblewrap. There have been some great posts from the bloggers about the shadowboxes but I think my fav is HERE.